The week before Christmas, I made a sneaky weekend getaway... to Canberra! Our nation's capital is a quiet little city, and I sure did get some funny looks from my friends and coworkers when I mentioned I'd be going there for a holiday. But I actually love visiting Canberra, not least of all because my good friend An lives there! We filled the weekend with visits to restaurants and cafes. Good food, good friends. What more do you need? 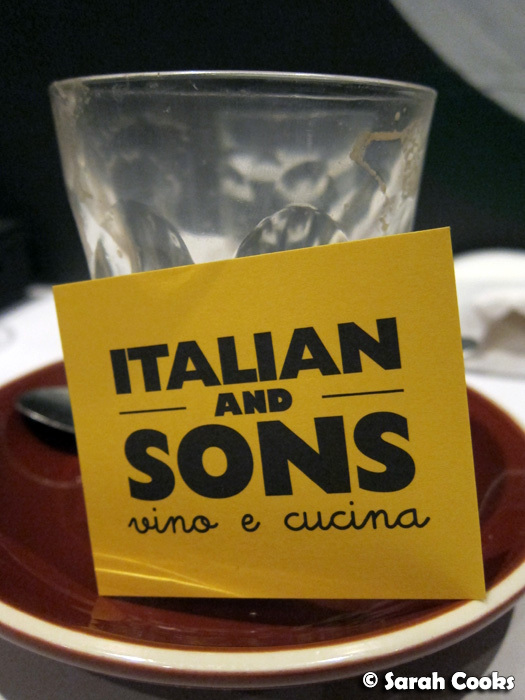 First stop was Italian and Sons. Italian and Sons reminded me a bit of D.O.C. 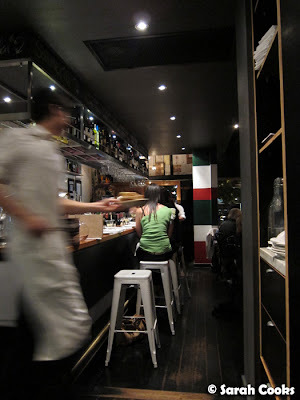 Pizza Bar in Melbourne: an Italian restaurant with a strong emphasis on the provenance of ingredients. Of course, being Canberra, there weren't any crowds and we were able to book in advance - yay! 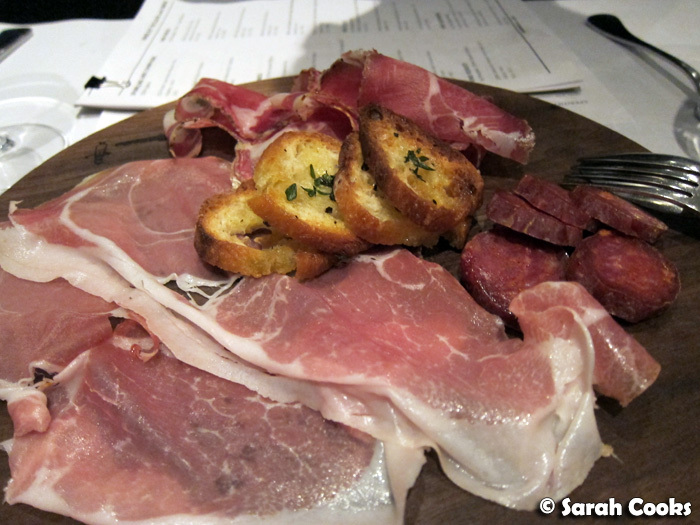 We started off with a plate of affettati - a selection of cured meats. From the menu we chose San Daniele prosciutto, capocollo and cacciatore salami. 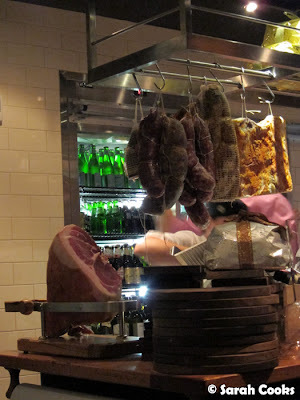 Apart from the San Daniele prosciutto, all the meats are cured in-house. The cacciatore was very chewy and spicy, in great contrast to the soft and mild prosciutto. 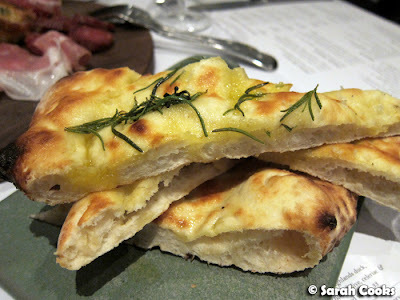 We also ordered some foccaccia to go with, baked in their wood-fired oven. It was well made, crusty and hot, but I found it a little heavy-handed with the salt, especially when served with the salty cured meats. And now, the mains. The menu offers a range of pizzas (both with tomato and in bianco), pastas and specials. None of us were in the mood for pizza that night, so I suppose we'll have to save that for next time! 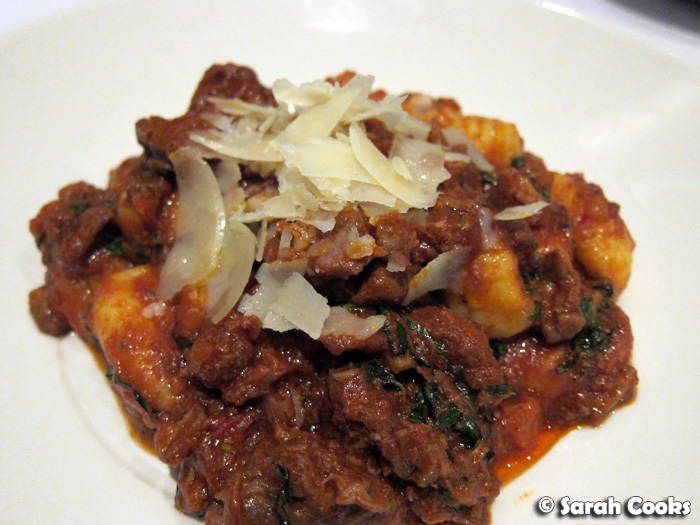 I snuck a little taste of the potato gnocchi, and loved the light texture against the rich, tender veal ragu. 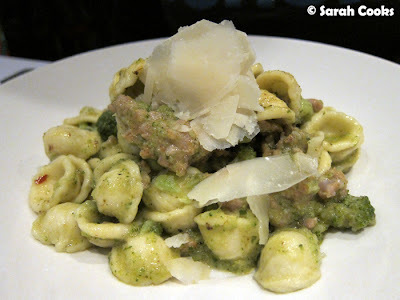 For my main, I chose the orecchiette with suckling pig. How could I go past "suckling pig"? Whilst I enjoyed this dish, I found it a little sweet, and it needed quite a bit of salt to balance it out. The fish here was fresh and cooked well - with crispy skin and tender flesh that flaked apart easily - the real star of the show was the peperonata. 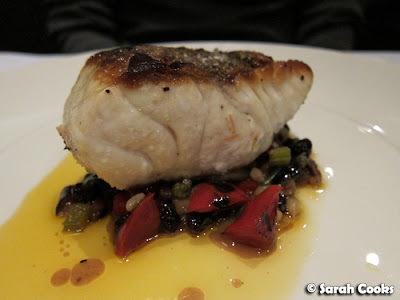 It had a great balance of sweet and sour, complementing the gentle flavour of the fish. We also got a side of farro, baby beetroot and house smoked ricotta. 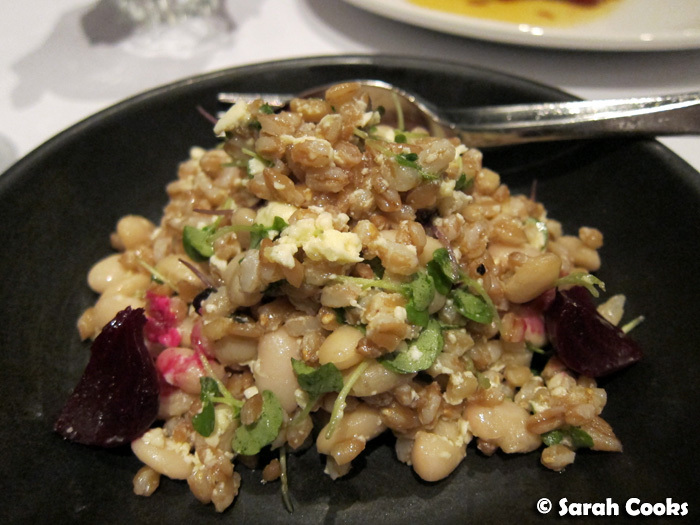 I love me a good grain salad, and this one was fabulous! I daresay it was even better than my pasta dish - I could have easily eaten this as my main in its entirety and been very happy. I must try and recreate this at home. The panna cotta was smooth and creamy, and quite firmly set. 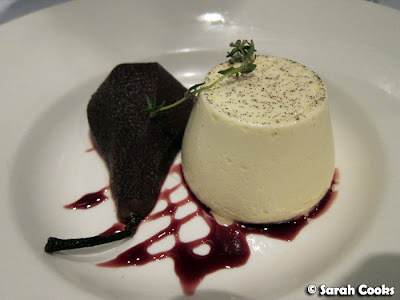 I'm not a huge fan of red wine in desserts, so didn't like the pear too much, but the panna cotta itself was lovely. The service at Italian and Sons was excellent too. The staff were friendly and welcoming, and were very helpful when it came to navigating the menu (especially when we were deciding which affettatti to order). I'd definitely like to visit again the next time I go to Canberra! Yay Canberra! This is exactly the kind of positive thing I needed to read on the night I returned home from Melbourne, where my heart was soaring constantly, and have to face normal life and work again. Welcome home Hannah! I think your city is fabulous, lots to enjoy there - keep your chin up! On a random note, I wanted to go to Yong Green tonight, but of course it's closed now (as you told me). We tried Loving Hut on Victoria Parade in Richmond - lots of tempeh and tofu and brown rice, with raw organic banana/cashew ice-cream. Another one for you to try when you're in Melbourne next!! Oooh, sounds wonderful! Lisa and I ended up at Shakahari, with the most *hilarious* waiter I've ever met. Unintentionally hilarious, that is. What’s odd about going to Canberra for a holiday? From what you’ve just shared it sounds like the perfect place for certified foodies!